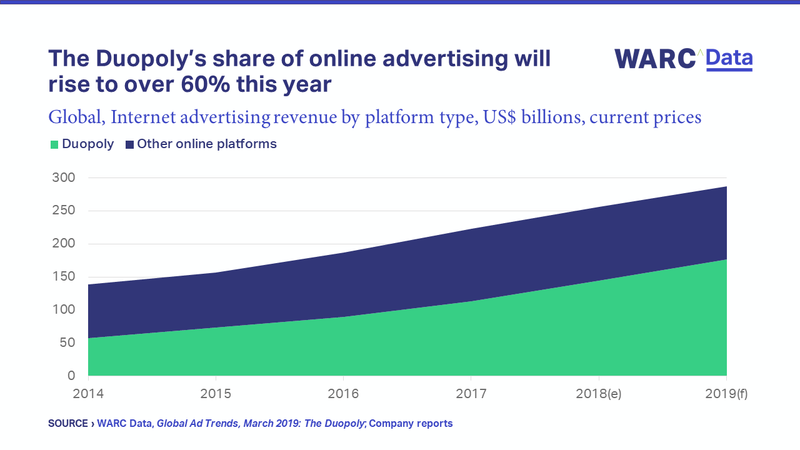 The latest WARC Global Ad Trends focuses on the duopoly and says that of the $590.4bn spent on advertising worldwide last year, $144.6bn (24.5%) went to Google and Facebook, which equates to almost one in four dollars. The duopoly’s adspend share is up from 20.3% in 2017 and is more than double the 10.8% recorded in 2014. WARC predicts a further increase to 28.6% ($176.4bn) this year. “One of the main reasons for the duopoly’s success is their creation, and subsequent ownership, of the digital formats perceived to be most effective by adland’s decision makers: paid search and social,” observed James McDonald, Data Editor, WARC, and author of the research. “Google dominates the search engine market, handling almost all mobile searches worldwide and nine in ten on desktops. Meanwhile, ad buyers can target Facebook’s 1.48bn daily users by leveraging a rich cache of personal data,” he added. This report summarises the latest research from WARC's Data platform, with a focus on the Google/Facebook 'Duopoly'. An overview of Google's search and browser penetration by device between 2009 and 2019.